Image Size: 26 X 20 in. 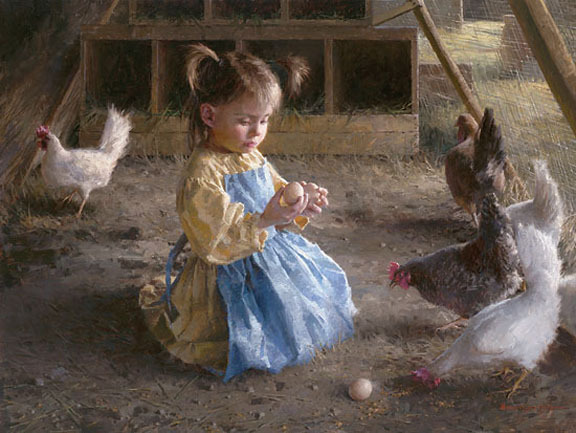 Coming on the heels of Emmie’s Catch, Morgan Weistling’s sold-out contribution to the Greenwich Workshop SmallWorksTM collection, is The Egg Inspector. "I never cease to be inspired by the wonder and curiosity of children,” says Weistling. “This little farm girl loves to spend time with her chickens and found her way into the coop one day. This serene moment I painted changed rapidly after she decided to stick her thumbs into the eggs to see what would happen. It got pretty messy."